Multichannel pipette. Smooth tip mounting & ejection. 8 & 12-ch. 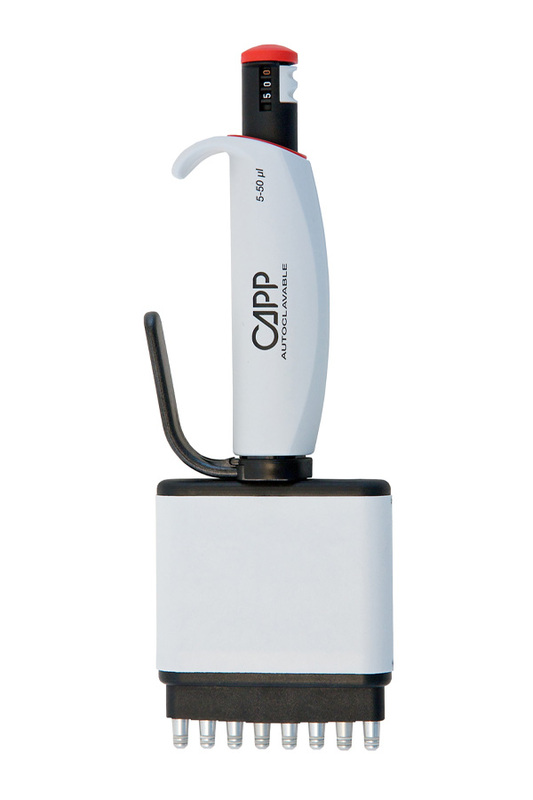 CappAero multichannel pipette has a unique construction, ensuring extremely easy tip mounting and ejection. Both the 8- and 12-channel pipettes have an external ejection lever, assuring ergonomic and effortless tip ejection. This unique construction of Capp multichannel pipettes enables the thumb to rest under tip ejection and helps to activate the other fingers, considerably reducing the thumb workload. Tip ejection is simply a matter of applying light pressure to the levered ejector arm. Excessive thumb workload by multichannel pipetting is one of the major causes of repetitive strain injuries and user discomfort. Apart from the external ejection lever, the lower part of each 12- and 8-channel pipette is slightly bent in order to eject only 2 tips at a time! This happens so smoothly, as if all 8 or 12 tips were ejected in one take, but this special construction of the lower part distributes the pressure and minimizes the workload. 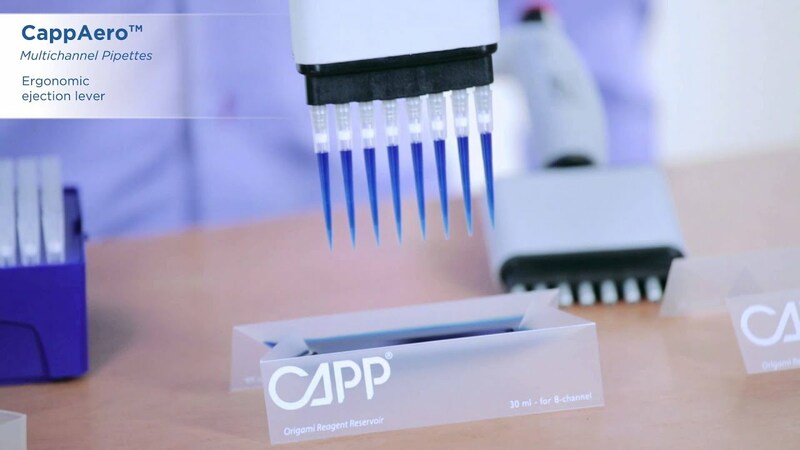 Each tip cone of Capp multichannel pipettes is made of anodized aluminum and has double O-rings, which all together eliminate the need to ‘hammer’ the pipette into the tips rack to secure the optimal tip mounting. The 'hammering' is quite a common issue by multichannel pipetting with many other brands. With Capp multichannel pipette you only need to apply a slight even pressure to perfectly attach the tips to the nose cones. 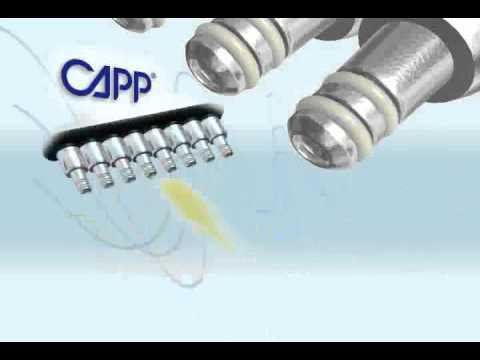 CappAero multichannel pipettes guarantee single channel accuracy and precision across all channels due to the special design and construction of the Capp piston assembly. 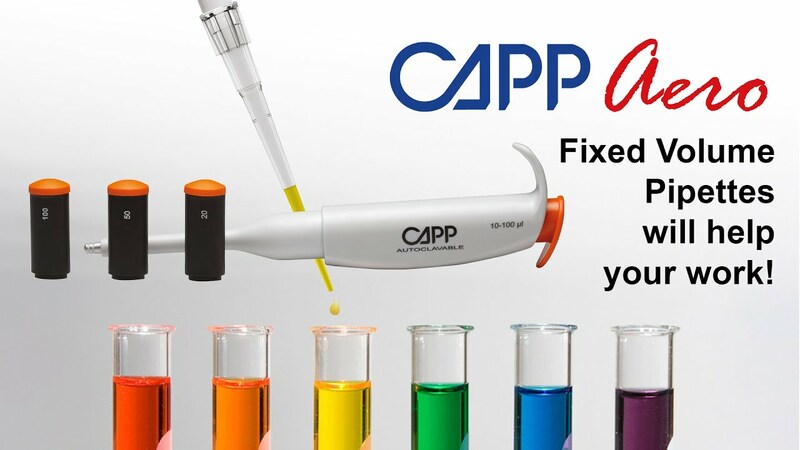 Capp 8- and 12-channel pipettes are incredibly robust and fully autoclavable, offering easy maintenance. The use of anodized aluminum and metal nose cones instead of plastic ones substantially reduces risk of breakage due to accidental dropping and tip mounting. The lightweight metal components and stainless steel pistons ensure a highly robust performance for ultimate stability over time in terms of accuracy and precision. This smart and highly ergonomic multichannel pipette is built to last! See also CappOrigami reagent reservoirs, perfect for 8- and 12-channel pipettes. Choose between variable or fixed volume controllers. Lockable variable volume controllers. Fixed controllers for routine work available on request. Considerably reduces the thumb workload. Provide extremely comfortable tip mounting and ejection. Reduces the risk of breakage. Same accuracy and precision of a Capp single channel pipette due to special design and construction of the piston assembly.